We had a good storm last Friday that dumped not only rain here in Carson Valley but up to 12” of new snow in the high country. This was very welcome and, again, no one complained. We love weather that brings us moisture. Upon completing the business, we zipped over to Red’s, our favorite VC ice cream store, and treated ourselves to some very tasty cones. Wild horses are quite numerous in the VC area and we decided to take the truck route (a bit longer and gentler slope) home in hopes we could see some. 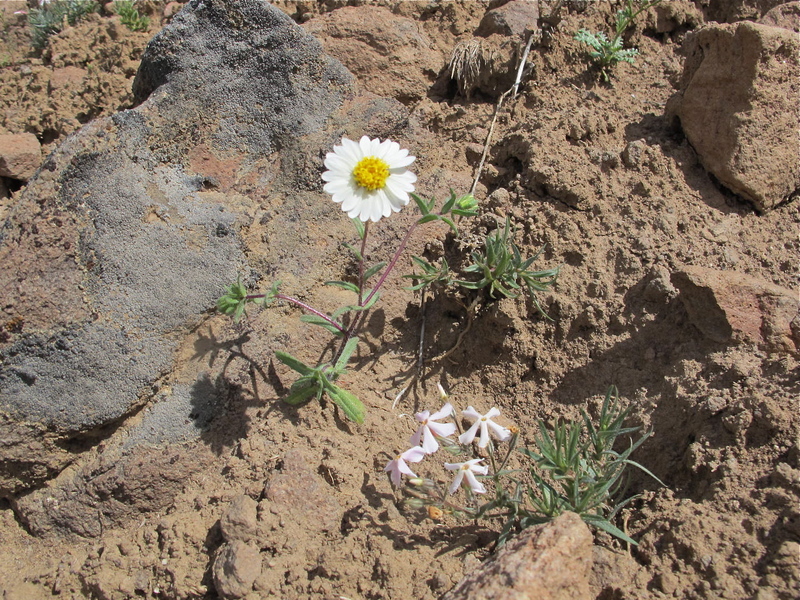 Nary a horse did we see, BUT we were treated to spectacular display of high desert flowers. 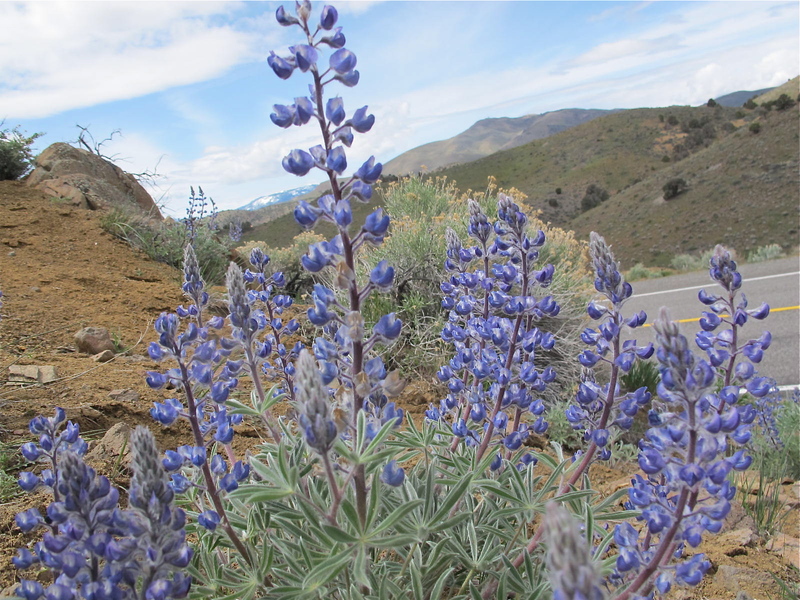 Jerri has been in northern Nevada for almost 29 years and has never seen them so numerous and colorful. We stopped several times to feast our eyes in an up close and personal nature. 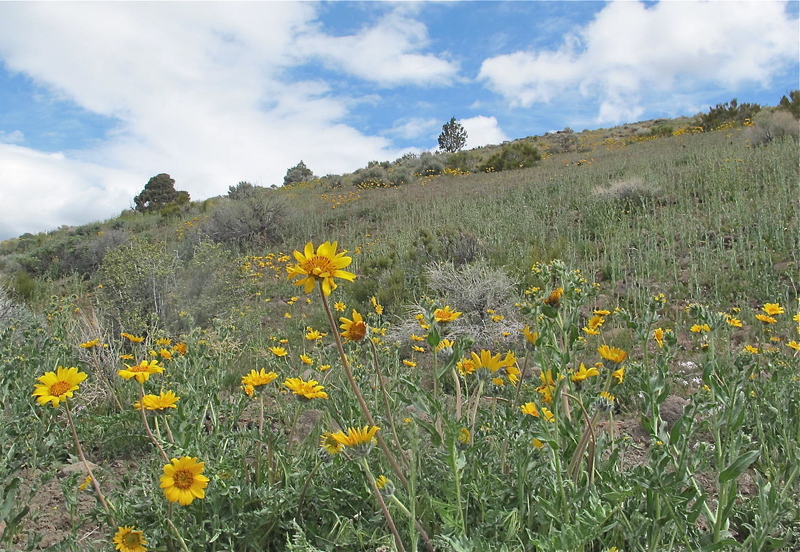 The bright yellow of the arrow-leafed balsam-root caught our eyes first. They are so perky as if they are reaching toward the sun with all their might. I like the tiny flower of the red-stemmed filaree. 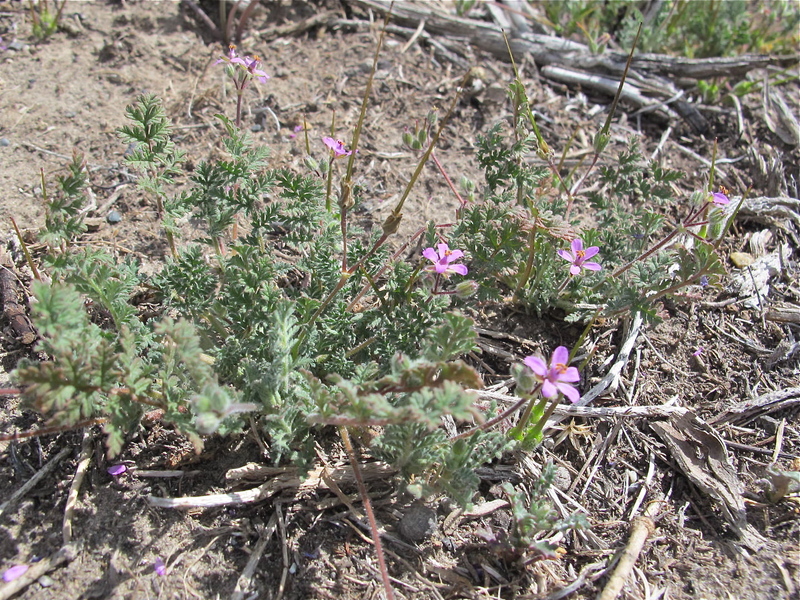 But these little posies are really a weed. We used make play scissors out of their spikes. When the spikes dry out, they turn like corkscrews, thus driving the seeds into the ground. Spikes haven’t developed yet on this plant. 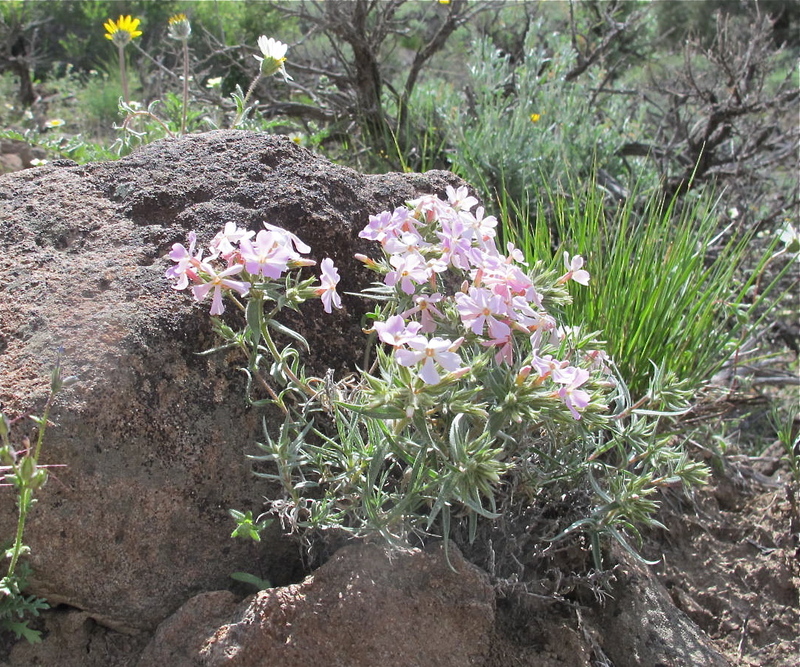 The spreading phlox looks as though it’s growing out of some rocks. 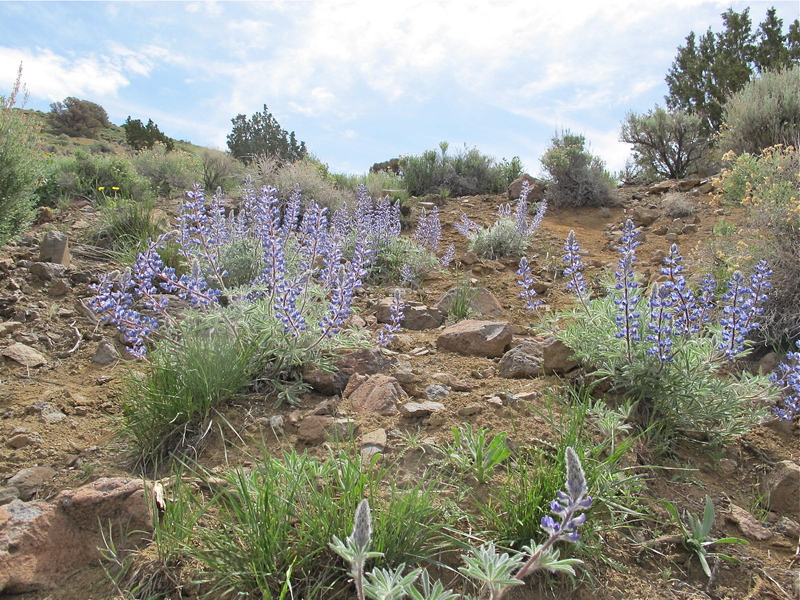 Coleville’s lupine has a sweet smell and makes a pretty spot on the hill. 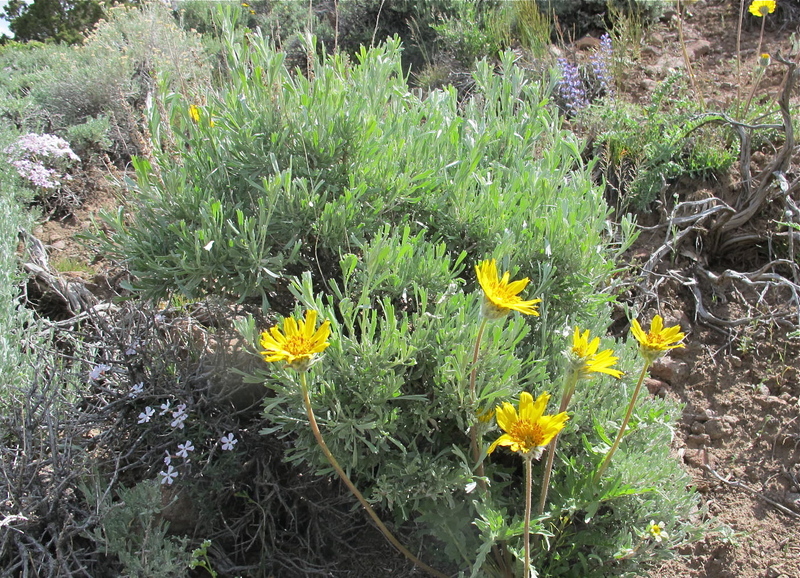 Note the silvery aspect on the leaves. This is looking southwest and the bit of snow you can see is on the Sierras. 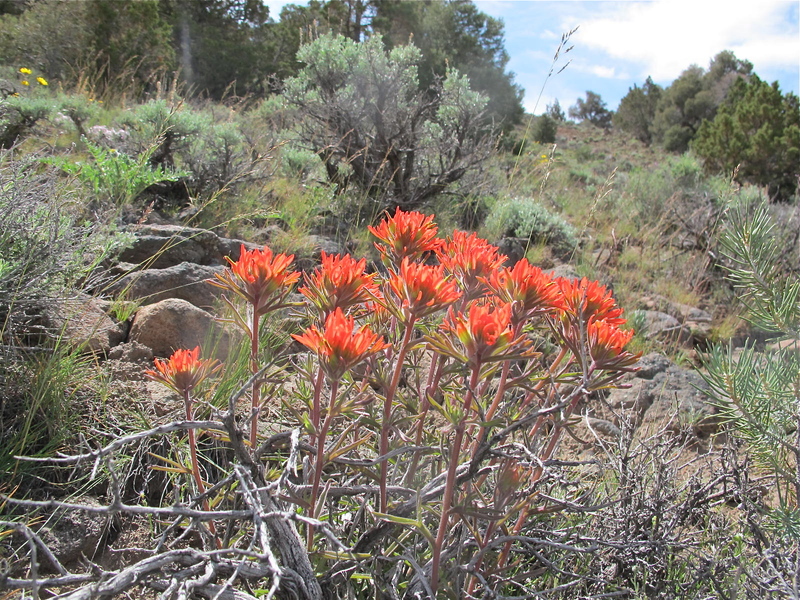 We always called this flower Indian Paintbrush. It must not be PC now to do that and my book put out by the California Academy of Sciences calls it Giant Red Paintbrush or it could be Applegate’s Paintbrush. I’m not sure. At any rate, these plants really stand out in the brush. At first, I thought this lizard was a baby chuckawala but I don’t think they live in our area. 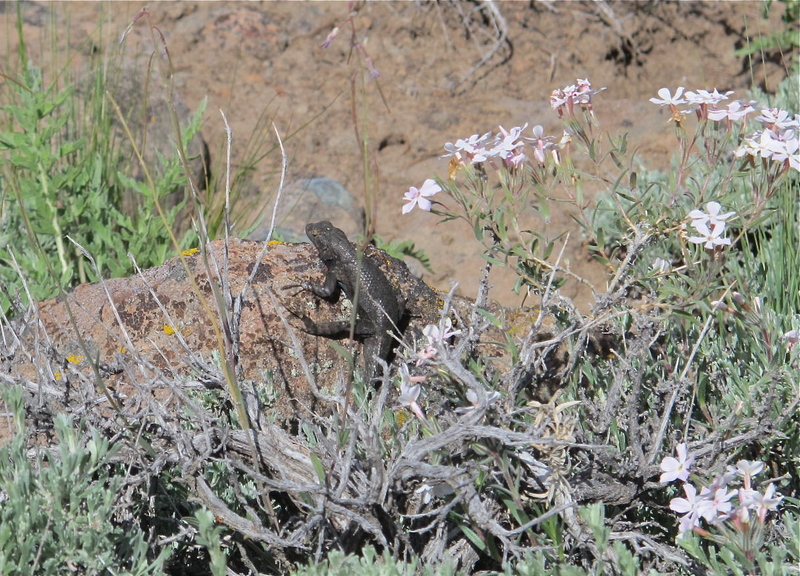 For lack of a better term, he’s just a fat, black lizard checking out his world. I thought this was a yellow salsify. But another look said no. 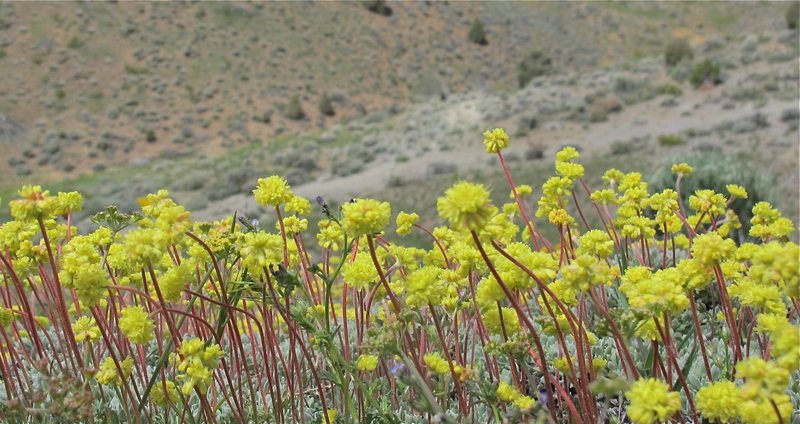 It might be a hoary buckwheat. Anyway, it’s pretty. There was much evidence of the wild horses all over the area on which I walked. 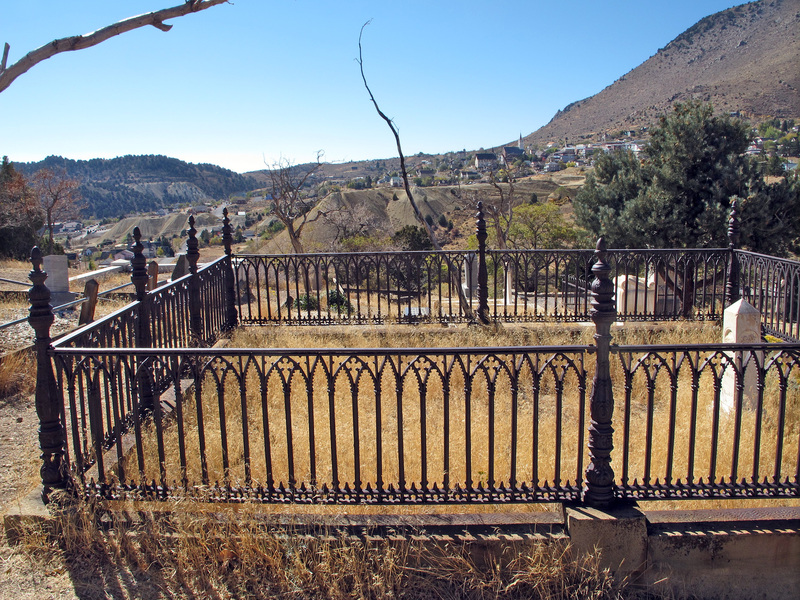 Hoofprints, horse apples, and, sadly, even a skeleton. 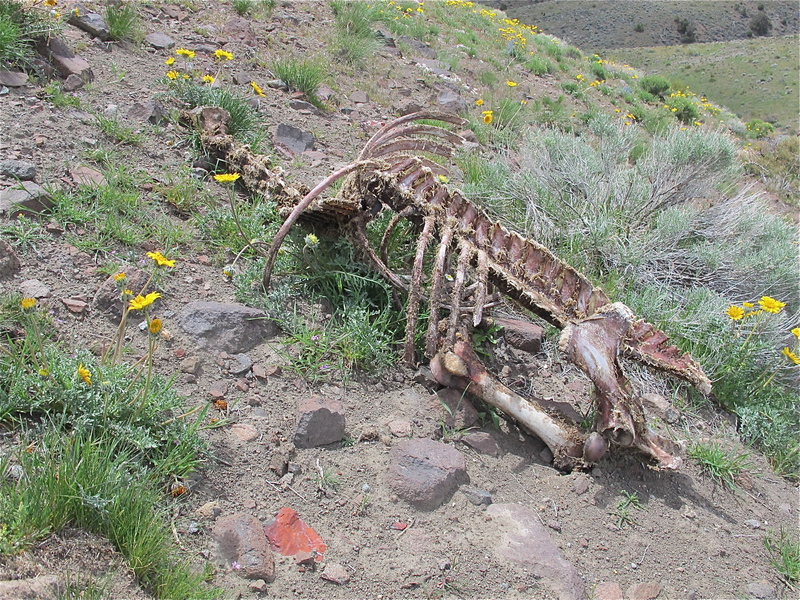 I only show this because, even in death, the horse provided life to other creatures, and maybe even gave a bit of nutrient to the flowers that were growing through and around it. 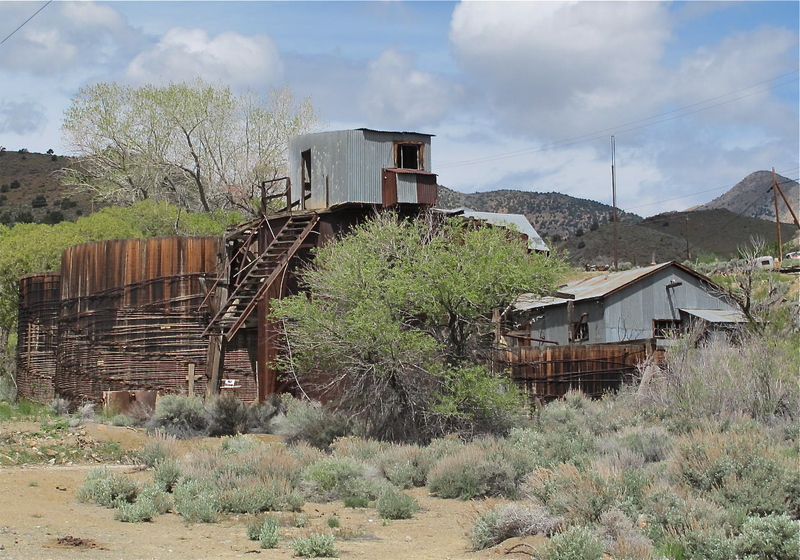 There are abandoned buildings and mining equipment all over the Virginia Mountains. These are all just off the side of the highway. 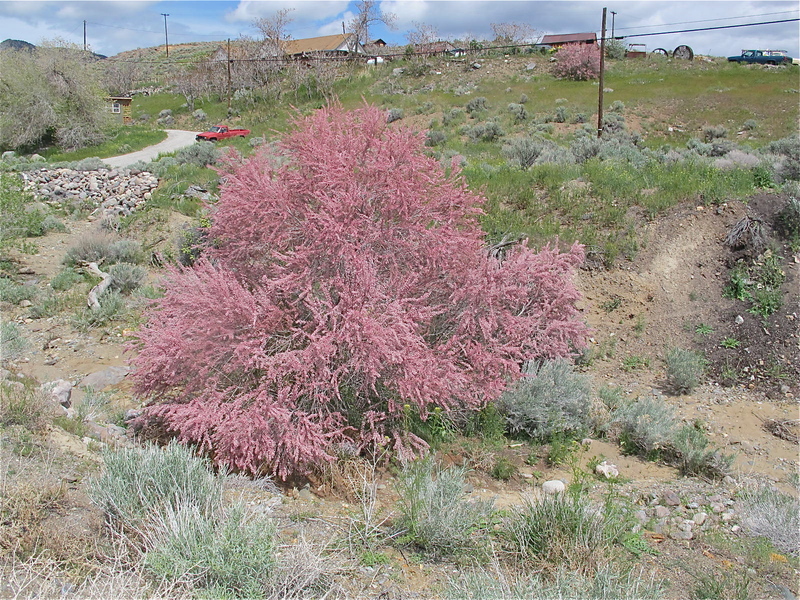 Just a short distance from these abandoned buildings and equipment was this pretty tree/shrub. You can see modern houses and vehicles in the background. 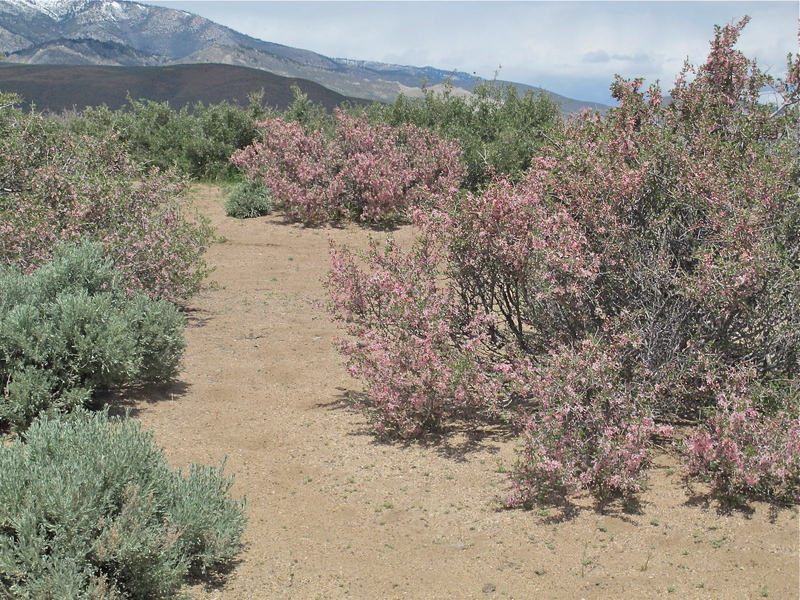 Just about a mile and a half west of my home is a good stand of desert peach. It’s in bloom quite a bit in our valley. One doesn’t want to run into it because it has a nice set of long stickers! Boo!!! The little bit of snow you see in the background is on the Sierras. I really enjoy being able to get out and see these different plants and come to realize that each has its own area in which to live. There is just so much to see and learn about. Keeps me busy! I should probably put a caveat on this epistle. Jerri and I went together and found this floral display but I didn’t think to take my camera. 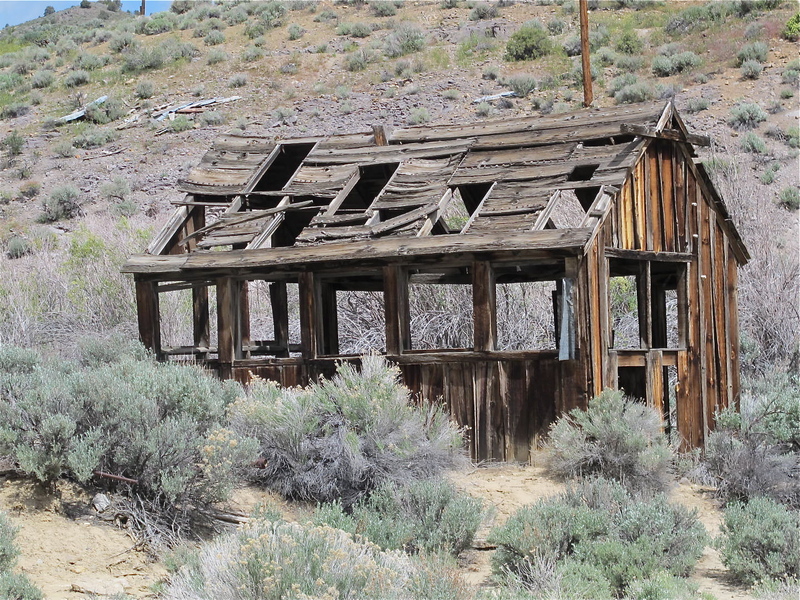 So I went back the next day and redid our trip. Also, I am fairly sure of the names of the plants but could be wrong. 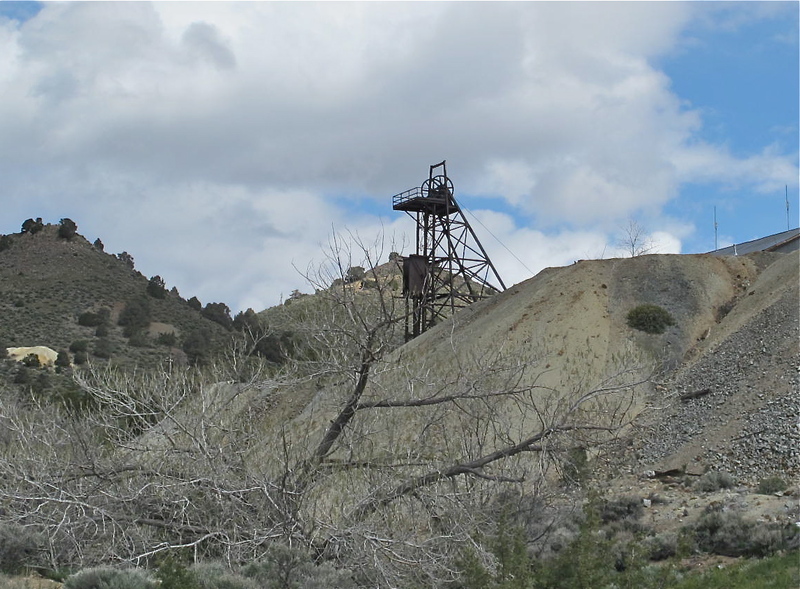 I used The Laws Field Guide to the Sierra Nevada by John Muir Laws. How could I go wrong with a name like Muir?